I had checked the bus schedule in Luang Nam Tha, even so, we arrived thirty minutes early because they often fill up. Unfortunately, the bus was already full and leaving–thirty minutes early! We hopped on the next songthaew when it pulled up to ensure a seat but ended up waiting one hour and forty five minutes to leave. My assumptions of what “full” means was drastically altered on this ride. Not only were people sitting sideways on the benches to fit more people, but women and children were squatting in the floor, men were hanging off the back and sides and a few people were riding on the top with the luggage. The ride was only a few hours but very uncomfortable at full capacity. 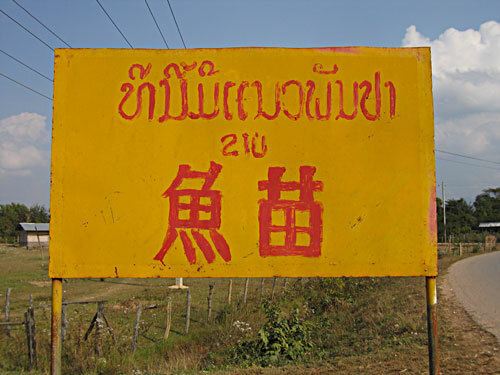 Muang Sing is next to the Chinese border–hence, both languages on road signs. It wasn’t long into the ride before the little girl sitting on my feet began to throw up. I’m not sure if I’ve mentioned it here before, but the locals in mountainous regions of SE Asia and China have terrible motion sickness. I’m don’t know if it is genetic or because they don’t ride in cars often (most of the affected are hill tribe women). Without fail, on every curved or hilly road someone throws up. In fact, bus drivers often hand out little clear plastic baggies for this very purpose. Nobody paid attention to the girl, not even her mother, so I gave her some toilet paper to wipe her mouth off with. She placed it in the baggie with her yellow vomit, stretched across me and threw it out the window. I wasn’t even phased, I’ve seen this before. I am convinced that the roads of Laos are covered in bags of vomit. Upon arrival in the tiny town we booked a room and went our separate ways to explore the area. Monks at the local temple were very shy and wouldn’t allow me to photograph them. Other locals wouldn’t allow photography either. I asked a boy sitting by his bike on a deserted road and he asked for money. Obviously, people were tired of tourists coming to Muang Sing. I walked about a mile North of town but saw only farm animals and the mountain range which separates Laos from China. I stopped at an abandoned gas station to admire the rice fields and mountains when a man came up to me on a motorbike. He asked me if I was a native English speaker and if I could translate some legal documents for him. I said no. He went on to say that there were just a few words he didn’t understand. When I asked him if he had the documents with him he said yes, they were in his head. I wasn’t sure how to translate things from his head and the conversation was only getting stranger. You never can tell if a person like this is strange, trying something funny or is just really bad at English. I backed away slowly and made my way into town. 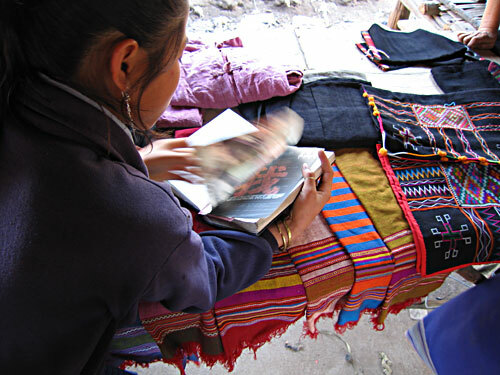 The local Akha women were out selling the usual bracelets and belts. I bought an old Indochina coin with an altered date on it from a very persistent woman. 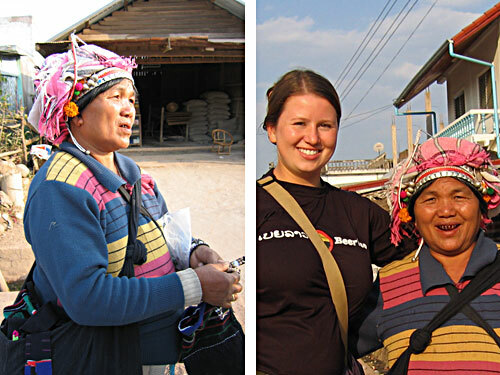 Akha women like to sell to tourists. At least they make me feel tall. I ended up writing in my journal until dinnertime. We went to bed early for lack of anything better to do and got up at 6 am for the market. I didn’t bother with a shower (cold water, plus I left almost all of my stuff in Luang Nam Tha) and headed out to get breakfast. It turned out that no restaurants were open so we walked over to the marketplace where the songthaew had dropped us off. People were setting up but no tribe women were around. The restaurant we had eaten at the night before opened up and we mentioned the market. He explained that there are two markets and the one we wanted was on the other side of town. Having wasted thirty minutes we rushed down the wide, dusty road to the open area where vendors were selling everything from toilet paper to raw chicken feet. It was great. Blood, chicken feet and sweets for sale at the market. Many tribes were represented (Akha, Tai Dam & Yao) as well as Chinese and Lao. I was disappointed there were no Lantaen in the area to buy jewelry from but the Tai Dam costumes were very colorful and the Yao women were striking in their red yarn “boas”. I had never seen a Yao woman in person and they are much larger than Lao women with a round face and Chinese features. The Tai Dam were thinner with a more Southeast Asian feel about them. Many of the teenage tribe women had decorated their traditional costumes with colorful foil and fluorescent beads and thread. There was much more creativity and customization of costume here than anywhere else I had seen. I’m sure I would do the same in their place. It was hard to blend into the crowds and even harder to take photos without being noticed. There’s some great photos of the market up in the gallery. Woman showing me how to fold a scarf similar to the one I bought. By the time the sun broke out of the clouds most people were packing up. We headed back into town and visited the “other” market. Tribe women were sitting at the back selling their embroidery. I bought a black scarf from an old woman and let the kids look through my sketchbook. They were most interested in the McDonalds ad I had in there from China. Girl looking through my sketchbook. The ride back to Luang Nam Tha was uneventful except for the large proportion of Chinese onboard. They were talking loud on cellphones and spitting on the floor–both cultural traits I saw all over China. The military took an interest in our passengers and we had to stop for a short time while their papers were inspected. I’m not convinced that bribes weren’t given. Back in Luang Nam Tha I prepared myself for my final days in Laos.